Very pretty squares! The bullion stitch is so pretty when done nicely. Nesa is going to love them! Lovely! I’m sure that Lesa appreciates all the work that went into these! …and thanks for the information about taking the photographs. I often have difficulty capturing reds. I’ll have to see if I can use the same settings you’ve used on my Powershot (I have an old A85). I’ve never been able to get the hang of bullion stitches…great job! Those are so pretty. I have never tried the bullion stitch. 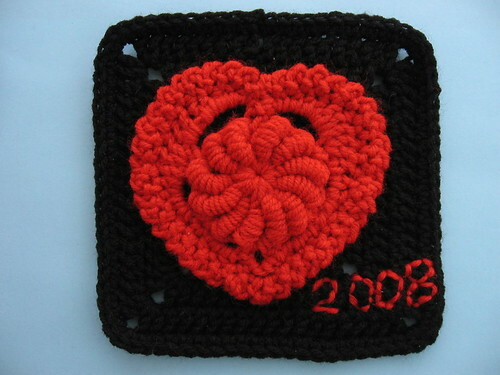 And I really like how the heart square spirals in the middle. I LOVE the first square best! I have always had secret passion for the bullion stitch. Those are gorgeous squares, especially the heart one! 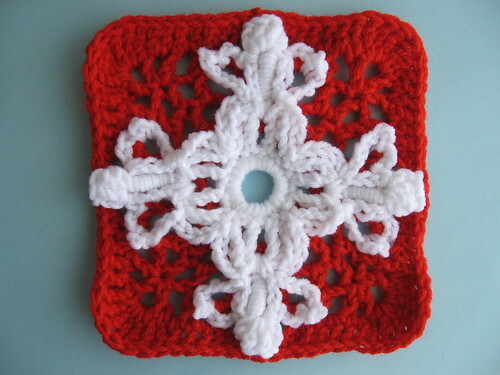 I’ve never tried a bullion stitch – I have a hard time with popcorns, bobbles, etc. Great squares, and I’m sure she will love them. SO nice of you to make them. I like that stich, very interesting. I’ll have to give it a try sometime. Absolutely beautiful work. 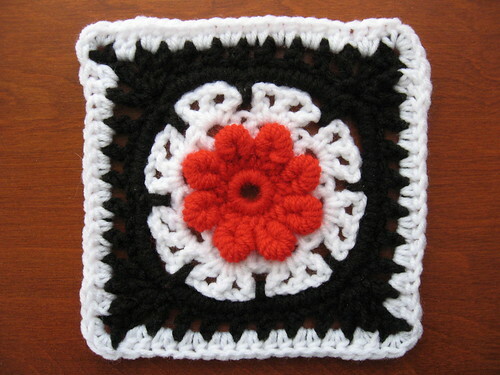 Inspries me to try crochet again!!! I’ve failed at it many times before. Those are really beautiful! You did such a great job! No matter how I try I can’t seem to do a bullion stitch. I even bought a special hook! People who can manage a bullion deserve a high degree of accomplishment in my book! Great work!! I would love to get your blogg each day and see what you are doing. Your ice cream cone and the star looking toy are so very nice. So very intricate and fine. It’s amazing how much “effort” doesn’t feel like it when it’s for someone you love. Wow! I just found your blog today and have been marveling at all of your fabulous creations. Question for you, is the Kate’s Bliss pattern still kicking around? AOLhometown has been shut down for awhile and I can’t find that pattern anywhere. Can you point me in the right direction? Again, you are a great crocheter and photographer!! Does anyone have the patterns for the squares on Katie’s Bliss? 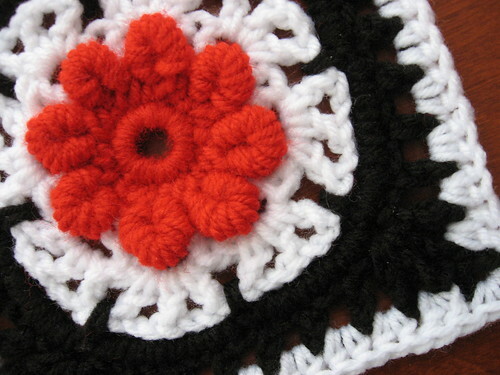 They are the ones with bullion stitches in the center, etc. I would appreciate copies. Thank you.